I just finished another great book in my naturopathy courses. 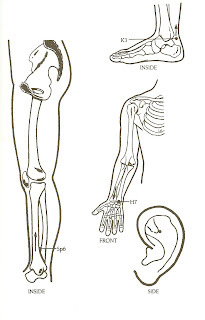 The book is called Acupressure Techniques and it's written by Julian Kenyon, M.D. It's a great do-it-yourself book to treat common ailments at home. The book gives some scientific backing on how acupressure can help a wide number of conditions and it then explains the treatment of approximately 30 common pain problems and thirty other minor conditions. After reading it, I am by no means an expert at acupressure massage, but the book did help me relieve some very pesky neck pain my husband was experiencing so I do think there is some value in reading this book and trying out acupressure at home. After reading this book I would love to have a professional acupressure massage and am even a little more open to the idea of acupuncture. Acupuncture has always freaked me out a little what with all the needles. 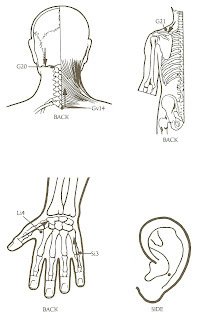 Acupressure centers around deep finger pressure over the traditional acupuncture points. Acupuncture is a very ancient treatment in Chinese medicine. The ancient Chinese considered that energy circulated in the body along specific channels, which they called meridians. This energy had to be able to circulate freely around the meridians and if there was a break in its circulation anywhere then illness or pain would result. If the energy got "stuck" somewhere then a needle inserted at the piont of discomfort whould encourage the flow to reestablish itself. 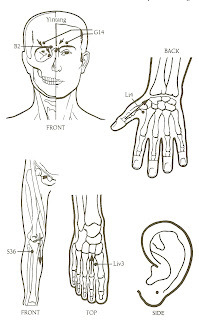 In acupressure, instead of needles, one uses massage of the "stagnant energy" to reestablish the flow. Many think this all sounds a little hoky and don't understand how this can work. The National Center for Complementary and Alternative Medicine has researched acupuncture and found it effective for several conditions including pain from knee osteoarthritis, post-traumatic stress disorder, improved rates of pregnancy in women following IVF, and pain from fibromyalgia. Check out their site for more details. Deep pressure with the thumb is the best way of stimulating the points. If the initial pressure is not uncomfortable then it's not being done correctly. Either the pressure needs to be increased or the correct point has not been located. Acupressure can be carried out on yourself, but if is much more effective if you can get a friend or significant other to do it for you. I've included a few diagrams below to get you started. Try them out. 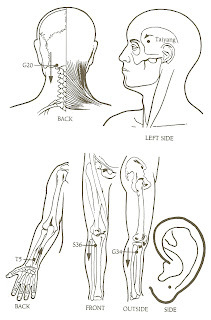 Massage in the direction of the arrow on the diagram.